Image borrowed from actual Jacksonville Eucharistic Congress site. 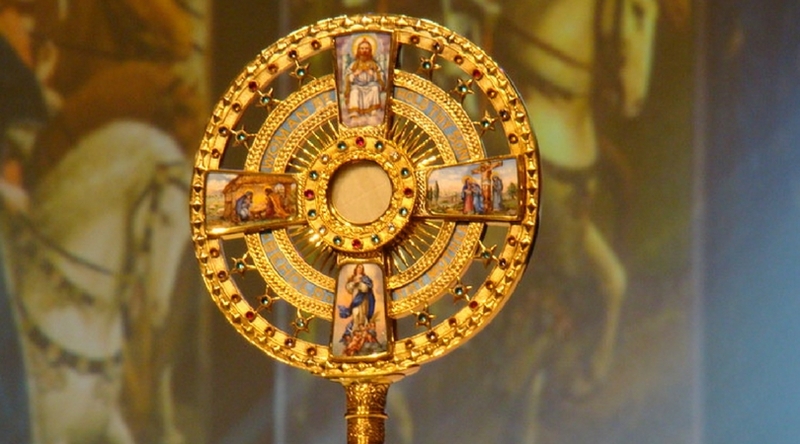 The Monstrance is the one used in the procession. There was confession offered by many of the priests throughout the duration of the event. This morning there was a Eucharistic Procession followed by Eucharistic adoration and the Holy Mass, which was celebrated by Archbishop Cardinal Wuerl, and many of the priests from our diocese. Just prior to the Mass, Cardinal Wuerl presented the keynote address. We did not get to attend the Mass, but the rest of the event was great and many faithful Catholics were able to spend the day re-evaluating the importance of the Eucharist and the Catholic Faith in their day to day lives. The focus of many of the talks was on the importance of the Eucharist, and how It is absolutely vital in our life….It is the Heart that beats Christ’s love into our day to day existence…It is the very source and summit of our lives...or rather…It should be…It nourishes us… Spiritually….as well as physically….We all need Christ. We all need the Eucharist. But unfortunately, many fail to understand this simple fact. As Christians we are called to be Christ to an often secular world. What better way to do this than by uniting ourselves with Him… We all need to recharge ourselves in the Lord….We need to allow ourselves to be filled with His Love…and His Words… Most of us do this at Mass…but this weekend...this Eucharistic Congress… was a chance to get totally immersed in the message of the Eucharist and Christ’s Love. It was a special way to get away from the ordinary….A special way for us to prepare ourselves for this quickly approaching Holy Week….it was a time that reminded us that we need to be able to rest in Christ…. (Talk about the ultimate mini vacation. )…It was a nice break from the everyday… a nice escape from the secular world and the chaos that so often threatens the peace of our souls. Anyway, back to Saint Patrick’s day. At the Eucharistic Congress there were quite a few people dressed in green for Saint Patrick’s day, but honestly not as many as I would have guessed, considering that it was a gathering of hundreds of faithful Catholics….and well, we all know Saint Patrick… was Catholic too. But after the Congress was over and we came home, I was unprepared for the amount of non-Catholics on television who were dressed in green! The local news was reporting from a bar in town and everyone was wearing green. Their shirts, and pants… many were even wearing glittering green hats and shamrock buttons! In fact it was a both sad and hilarious at the same time, because the whole news story was titled “Just who was Saint Patrick?” And no one they spoke to really knew who Saint Patrick was or why he was important… Several people even joked that it was just a drinking holiday that celebrated green Irish beer! It reminded me of the post I wrote last year…so instead of rewriting the same sentiments from last year, click here to read about the life of this truly remarkable saint who deserves to be remembered for more than a secular celebration that promotes green beer, lucky clovers and leprechauns. Remember, we only have a few more days of Lent to help us prepare ourselves for Holy Week and Easter, so take it easy on the beer and maintain your focus on the Eucharistic Christ and perhaps spend more time in prayer adoring the Lord who made you…adoring the Lord who loves you, more than you could ever know. Dear St. Patrick, in your humility, you called yourself a sinner, but you became a most successful missionary and prompted countless pagans to follow the Savior. Many of their descendants in turn spread the Good News in numerous foreign lands. Through your powerful intercession with God, obtain the missionaries we need to continue the work you began. This entry was posted in Catholic Feast Days, Some thoughts and tagged Eucharist centered prayer life, Eucharistic Congress, Father Larry Richards, Saint Patrick's Day. Bookmark the permalink.